Kitchen Remodeling: Let’s Get Trendy! Much like the fashion world, bath and kitchen design trends come and go. At Kiba Studios, we’re proud to say that we always stay ahead of the curve. In today’s post, we’ll explore three hot kitchen and bath trends we know you’ll love. When you’ve finished reading today’s entry, be sure to get in touch with us to get started on your remodel! You can start with an estimate, design your new kitchen online, or schedule an in-person appointment at your local Kiba Studios. We can’t wait to help you create a place you’ll love and cherish for years to come! There’s no shortage of questions that arise when you’re taking on a kitchen remodel. One of the most common questions we receive is, “Which kind of tile should I use for my new kitchen backsplash?” While there are a number of different materials we often recommend, bold ceramic tiles are one of our most popular choices. Ceramic tiles with bold colors have a simple elegance that can transform the look of any space, and they don’t have to be limited to backsplashes! Just ask one of our talented designers how you can incorporate bold ceramic tiles into your home. Space: Floating vanities can make even small bathrooms look large, as they don’t take up as much space as traditional bathroom cabinets. Accessibility: Floating vanity cabinets can provide you with more floor clearance, which makes them ideal for those who use walkers or wheelchairs. 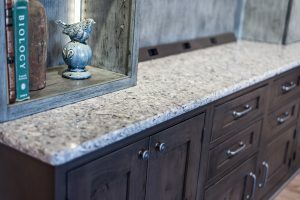 Flooring: If you’re installing a beautiful new floor as part of your bathroom remodel, then a floating vanity is the perfect way to show off as much of the floor as possible! 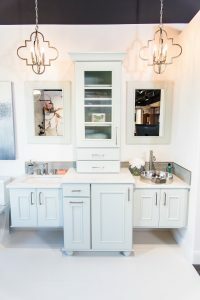 Flexibility: Whether you’re hoping to increase your bathroom’s storage capabilities or downsize to something more manageable, the flexible nature of floating vanities can accommodate all of your cabinetry preferences. Just ask one of our designers for more information! One of the best aspects of cabinetry is that it doesn’t have to always exist in the kitchen and bathroom. Cabinetry designs can be combined to create a mix of styles any place in the home Rustic modern designs are one of the most trendy design combinations, and they bring the charm of the countryside and the elegance of metropolitan designs together in a jaw-droppingly beautiful way. You’ll often find weathered raw materials in neutral colors combined with simple, sleek cabinets and fixtures. The result? A warm and charming space that lends itself to almost any décor. We’ll gladly help you design a rustic modern kitchen, bathroom or any unique space you would like — just reach out to a designer to learn more! Start Your Kitchen or Bath Remodel Today! 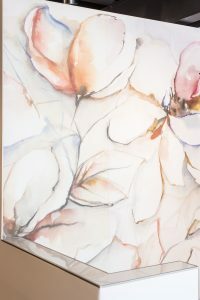 We hope that today’s post will provide you with the inspiration you need to transform your home. We’ll provide you with additional information about the latest bath and kitchen design trends in future posts, so be sure to check our blog regularly. If you’d like to get started on a kitchen or bathroom remodel, then visit this page to get started with an estimate! You can also stop by your local Kiba Studios to view all of our kitchen and bath remodeling products for yourself. Every home tells a story. Start telling yours today!